Finally, you have found the home of that Pokemon that has eluded you for so long. At the end of this road, Moltres awaits your arrival. Luckly, the path is short and sweet. Crush your opposition and reach the top of Mt. Ember! At last you've arrived to Mt. Ember. 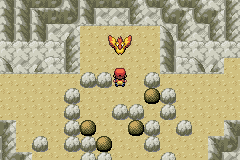 Before confronting the mountain, make sure to bring plenty of Ultra Balls and Burn Heals. In addition, an Escape Rope or two would not be also a bad idea. The first person you'll meet is in fact a Move Tutor, who will offer to teach one of your Pokemon Explosion. If you head East from the entrance, you will see two Rockets planning something. They are obviously up to no good, but it is not yet time to interfere with their plans. Take the West path of the mountain. You will need to use Strength to continue and tackle the trainers. When you reach a rock that can be broken with Rock Smash, do so, and enter the cave hole. Following the other path will only lead you to a dead end. Magmar, the Fire Duck Pokemon, is an exclusive for Leaf Green. Magmar has good stats all around, only his HP and defense stats are somewhat low. His learnset is rightfully Fire focused, and at the level you encounter it, Magmar will have already have Sunny Day and Fire Punch in his arsenal. Given that you find Magmar so late in the game, it will learn Flamethrower quite soon, at Level 41. If Magmar has a drawback, it is that you find it so late in the game. Despite this, Magmar is a great Fire Pokemon, and an alternative to consider if you did not get Charizard or traded for an Arcanine for your team. The trip within the caverns of Mt. Ember is somewhat long, but impossible to get lost in. Just head north to escape the confines of the mountain. Consider making use of some Repels just so you can avoid the great numbers of Geodudes and Machops you'll encounter on your way up. Finally, Moltres is on sight. Solve the very easy puzzle using a Pokemon with Strength. If you mess up, just go back down and up the summit. Once past it, save before confronting Moltres. It will be an arduous battle, but eventually, the Legendary Bird will be yours! Finally, now that your business is over, you can just run down the mountain, the path is clear for you. Just remember to pick the items from Mt. Ember before you do! 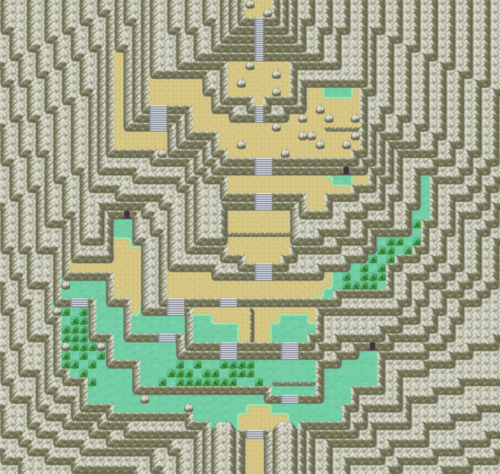 Head to One Island, speak with Bill if you haven't yet, and board the ferry back to Kanto. It is time to meet your final Gym challenge at Viridian Gym! The flaming bird, Moltres, is considered the weakest of the three Legendary Birds. Do not be deceived, however, as it is still a Legendary Pokemon, and by definition, very strong. Being Level 50, Moltres' Flamethrower will tend to take down all but the most powerful Pokemon, and with some additional TM's, Moltres can easily become a force to be reckoned with. Still, if you really want to use a Legendary bird in your team, you should instead consider Zapdos or Articuno instead, unless you really need a Fire type. Both Zapdos and Articuno's types help counter some Flying type weaknesses, while Moltres' Fire type only adds some more. This page was last edited on 18 September 2018, at 15:17. This page has been accessed 216,311 times.